BUENOS AIRES, Dec 23 2016 (IPS) - Organic agriculture is rapidly expanding in Argentina, the leading agroecological producer in Latin America and second in the world after Australia, as part of a backlash against a model that has disappointed producers and is starting to worry consumers. According to the intergovernmental Inter American Commission on Organic Agriculture (ICOA), in the Americas there are 9.9 million hectares of certified organic crops, which is 22 per cent of the total global land devoted to these crops. Of this total, 6.8 million of hectares are in Latin America and the Caribbean, and three million in Argentina alone. The Argentine National Agrifood Health and Quality Service (SENASA) reported that between 2014 and 2015, the land area under organic production grew 10 per cent, including herbs, vegetables, legumes, fruits, cereals and oilseeds. Legumes and vegetables experienced the largest increase (200 percent). In Argentina there are 1,074 organic producers, mainly small and medium-size farms and cooperatives. “The organic market is starting to boom. We have been producing since 20 years ago, when this market did not exist in Argentina and we exported everything. Now we sell abroad, but about 50 percent remains here,” said Jorge Pierrestegui, manager of San Nicolás Olive Groves and Vineyards, an agroecology company that produces olives and olive oil on some 1,000 hectares in the Argentine province of Córdoba. “Opting for organic was a company policy, mainly due to a long-term ecological vision of not spraying the fields with poisonous chemicals,” Pierrestegui said. Agricultural engineer Eduardo Cerdá, an agroecology adviser, differentiates between this practice and organic. Agroecology doesn’t use agrochemicals either, but it does not seek to certify production which is “concentrated in four or five companies” and which “has a cost for the producer,” he told IPS. “We basically work to generate experiences, to accompany producers, to train students, as part of a vision of agriculture based on ecological principles,” he said. Cerdá, who is vice president of the Graduate Centre of the Agronomy School at the National University of La Plata (UNLP), said there is growing interest in agroecology. In 10 years the area receiving specialised advice grew from 600 to 12,500 hectares. He and his few colleagues are not able to meet the demand. “Producers are seeing that the promise of 20 years ago of what this technology would solve has not been fulfilled. Neither in terms of high yields nor in costs. They see that the costs are very high due to the amount of inputs that they use,” he said. While in the 1990s, a hectare of wheat cost 100 dollars, by 2015 it had climbed to 400 dollars. However, the yields did not quadruple. Back then, a hectare produced 3,000 kilos, and now “at the most, we may be at 6,000 or 7,000,” he said. The ICOA attributes the growth of organic agriculture in Argentina to the increase in international demand, mainly in Europe and the United States. But he points out that organic crops still represent only 0.5 of the total planted area. In this country of 43 million people, agriculture is one of the mainstays of the economy, accounting for 13 percent of GDP, 55.8 per cent of exports and 35.6 percent of direct and indirect employment. “The main crops grown in Argentina are transgenic soybean, corn and cotton. Organic producers are still very few and far between and they mostly grow fresh produce. We can count on our fingers the farmers who produce ecological grains, because there is no government policy that promotes this production,” said Graciela Draguicevich, head of the Mutual Sentimiento Association. This association runs El Galpón, in the Chacarita neighborhood in Buenos Aires, which for 14 years has been a market supplying organic products based on the social economy. “We discovered that the main problem was the middlemen so we directly contacted farmers. But we looked for producers of products free of agrotoxics, because we thought that it was not a good thing to keep consuming toxic chemicals and getting sick from our food,” she told IPS. Members of the association have a different concept of what is organic. “It’s when they have no social or economic poisons either. When there is no exploitation, or gender-based wage differences, or child labour. Everything has to conserve a balance,” she said. Draguicevich is pleased that there are more and more markets like El Galpón, although not yet “one in every neighborhood,” as she considers necessary. 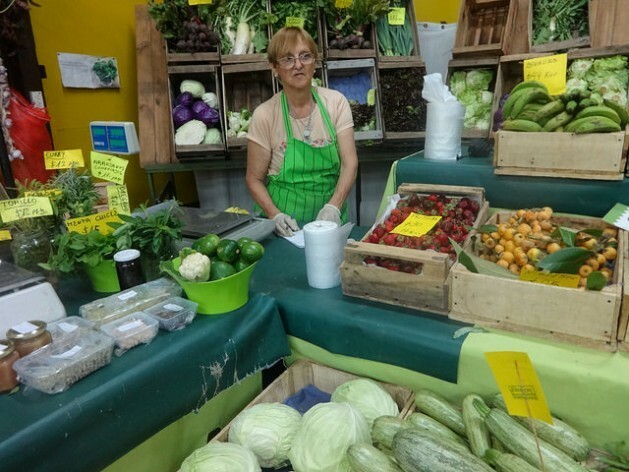 Alicia Della Ceca sells fruits and vegetables in this solidarity-based market, which she grows along her two children on 3.5 hectares of land about 20 kilometres from the capital. They stopped using chemicals 10 years ago, when the government offered them technical assistance. “Since my children are young and have an open mind, they were interested,” she told IPS. “It is beneficial for health, for the product, and for the earth. My husband 40 years ago used pesticides because it was the normal practice, it was thought that nothing would grow otherwise. But my children have demonstrated that it is possible to work this way. The land gives, there is no need to punish it with chemicals,” she said. “People who work with chemicals want things fast, in abundance, big and shiny. This is driven by the supermarkets. With neighborhood stores it was not like that. But the supermarkets imposed plastic bags and many other things that go against nature,” she said. A study on pesticides published in 2015 by the UNLP found that in the 60 samples tested, eight of 10 fruits and vegetables contained agrochemicals. “The level of pollution is really high. When we measure, traces of agrochemicals appear in the food, soil, water and atmosphere. And no matter how careful we are, our products, our grains, contain agrochemicals from our neighbours. It is a very perverse model,” said Cerdá. “Over the past 20 years, production of soy has grown to 20 million hectares (in Argentina). We are talking about more than 200 million litres of herbicides every year, plus other products that are applied, which is causing a very dangerous environmental explosion. A great loss of fertility lies ahead,” he said. Pierrestegui considers that this country has special potential for organic production. “Argentina is not a great world producer of olive oil, but it is one of the few that are able to produce it organically,” he said. “Spain, for example, one of the main global producers, works on very arid lands, where they need to use many agrochemicals and artificial fertilisers. Argentina has the advantage of good soil,” he said.